This special issue draws on the contributions from the 2016 International Consortium of Educational Development Conference (ICED) hosted for the very first time on African soil. The Higher Education Learning Teaching Association of Southern Africa (HELTASA) co-hosted this conference in Cape Town, South Africa, with the theme,‘Ethics, care and quality in educational development’. 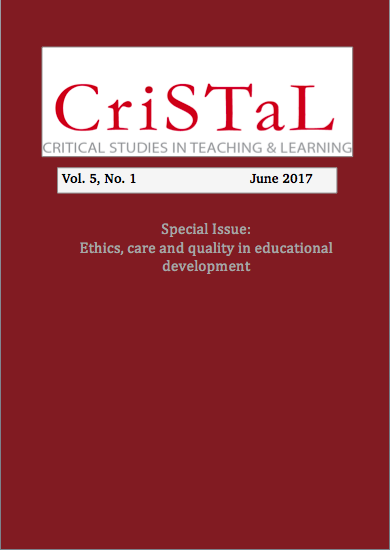 The contributions to this special issue of CRiSTaL focus on the conference subthemes that explore various aspects of our practice through the lenses of ethics, care and quality enhancement. As much as the contributions tackled these conference themes, the authors enrich this edition with articles that are well researched and with a focus on innovative and reflective as well as practice-based focused approaches to teaching and learning. The governmentality of teaching and learning: acquiescence or resistance?